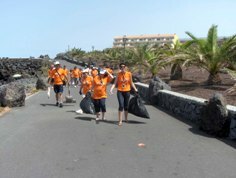 After the success of last year’s coastline cleanup campaign at San Juan, the beaches and shoreline of Alcala will undergo a massive clean up tomorrow, Saturday July 26th 2008. Work will begin at 9am when the volunteers meet in the Plaza de Llano, in Alcala. Several groups will be formed, and each will cover their specified area. At the same time there is a plan to inform all citizens about the rules of recycling and garbage separation. Siam Park is currently undergoing its final technical adjustments including safety checks and water flow studies for maximum amount of fun and safety for everyone. The dream has been realised and we are in the final stages before the grand opening. With great care and attention, the vegetation has continued to grow to achieve the camouflage of the structures on the attractions adding mystery to a whole range of surprises. Our art team are putting the final touches to the park, as in the big elephant which brings in good luck and represents harmony between Mankind and the Universe. This elephant also represents prosperity and was one of the reasons for the Burmese and Siamese war in XV century which fought to conquer the land where the white elephant lived. 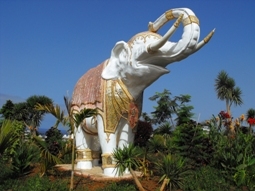 The artist Paolo Bonanno, created this 5m tall elephant which will greet visitors at the entrance giving the impression of an oriental setting in the most spectacular theme park with water attractions in Europe. Gone are my days of being able to fiesta all night and work all day! How the local Canarians manage it is beyond me, but they did, as every night of the recent eight day fiesta was well supported. Many of the winter residents had organised a couple of weeks extra holiday especially for the occasion. 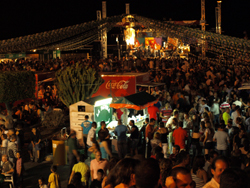 Around 4,000 people gathered in the Puerto Santiago Plaza as celebrations kicked off on Sat 12th with Fiesta Joven, (concert for the young) organised by the department of youth, Santiago del Teide council and the Cabildo Insular de Tenerife. Girl group Las K-Narias was top of the bill supported by Madel. The week continued with nightly entertainment by comedians, ventriloquists, clowns, folklore groups and many others, and the evenings always finished with a dance continuing almost to sun rise. 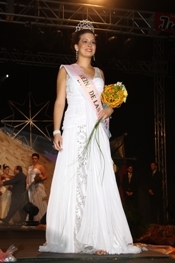 Gema Montesdeoca García(pic left) was crowned this year’s Fiesta Queen. Maids of honour were Selene Melián Gorrín, Ingrid Belardi Colombo, Mercedes Carmen Pérez Treiber, Yamilé Hernández Correa and Patricia Socas Domínguez. 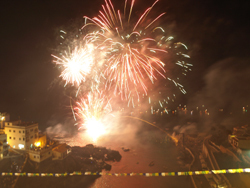 The big night was Sat 19th – Firework night. No work on Sunday, so armed with camera and all accessories we made our way to Puerto Santiago, pausing to laugh at all the youngsters’ attempts to stay on the bulls which were a main attraction at the fairground. A friend’s balcony above Puerto Santiago beach was the perfect viewing place, and over a couple of drinks we had a spectacular view of the procession and the fireworks. Each year the fireworks get brighter, louder and last even longer and the vibrations could be felt through the walls and floors – I did spare a thought for all those terrified pets in the area. Once the display finished it was back to the Plaza for another night of music and dancing to the wee small hours – this time to one of my favourites the Arguayo Band. ……..And if you missed it all, it will all be repeated at Santiago del Teide, Tamaimo, San Juan and Alcala in the next few weeks! 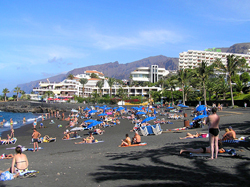 Tenerife is the top destination that Brits are jetting off to this summer, new research has revealed. Cheapflights.co.uk analysed searches on its website for holidays between May 1st to June 30th 2008 and the Spanish island came top, reports Travel Weekly. It was followed by sun-soaked Orlando, Florida, which thanks to the weak position of the dollar against the pound was 60 per cent more popular this year compared to the same period in 2007. 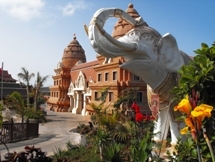 Other places popular with Brits included Euro zones such as Alicante and Malaga, while further afield the charms of Bangkok and Dubai are still luring in holidaymakers. The only Greek entry was Paphos (7th) and fellow European destinations The Algarve and Turkey also slipped into the bottom half of the top ten. 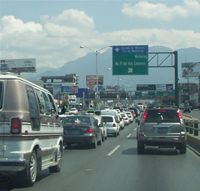 Police received a tip-off that a house in the Fañabé area was being used for production. Most of the plants were being cultivated in a small greenhouse and the rest disguised under a canopy. Police say the 26-year-old Italian, who now faces charges of drug trafficking, also had a small amount of ecstasy tablets in his possession when he was arrested. Augustin and Colette aim to have the bar back in full swing just like old times. They have owned the bar for 12 years. Many of us knew the bar originally as Tiffanys, until 4 years ago when it was refurbished and opened as the Blarney Stone. 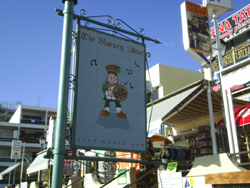 The Blarney Stone situated across the road from the beach at Playa de la Arena is a very friendly well run bar and restaurant. The food is excellent, the atmosphere very hospitable and the owners Collette and Augustine work extremely hard. The entertainment is good, there is a quiz every night and karaoke. We certainly enjoyed our visits there. The Christmas night meal was fantastic. Well done to all concerned. We spent Xmas again in Playa de la Arena for the fifth year running and went to the ‘Blarney Stone’ every day. The reception you get from Collette and Augustine is second to none. The food is of good quality and plenty of it. You must try the carvary – excellent. There is a great atmosphere on a night when people get up to sing. Sometimes you have to wait your turn to sing. They run a quiz every night. There is a great selection of beers, wines, spirits, cocktails etc. If you take a trip to Playa de la Arena, call in. It’s well worth a visit. 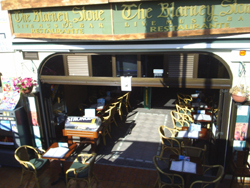 The Blarney Stone restaurant/entertainment bar will be open for breakfasts, lunches and evening meals with a varied menu and a special Sunday carvary. Their daily entertainment programme will be listed on losgigantes.com “What’s on locally” and will vary between live music, quiz nights and karaoke evenings. To celebrate the opening on Friday 18th Augustin, Colette and their staff have a great night lined up with live Irish music and a finger buffet, guaranteed to be a great night out and everyone is welcome. Los Gigantes Dive Centre owner Nev, having finishing his first days diving after returning from a well earned holiday, was relaxing over a well needed beer, when the marina suddenly erupted with activity! As the car was not over the water enough to tip the balance so it fell onto his boat Nev decided there was no need to panic, however a rope quickly appeared and the car was tied to the nearest lamp post until it could be winched back from the brink. 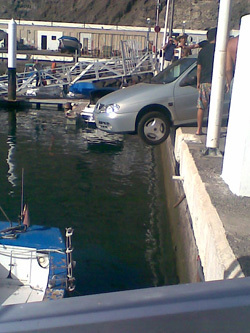 It turned out that the owner of the car, who wishes to remain anonymous, had forgotten to put the hand brake on, Oops! His major concern now with all the very enthusiastic boys in blue around:-Would he get a parking ticket as he was well over the newly painted yellow line! However the local fire brigade were soon on the scene and the car was winched back onto the road. New government rules revealed yesterday that false promises made by internet service providers could soon be a thing of the past. 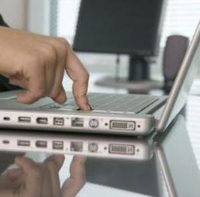 Industry Minister, Miguel Sebastián said the government wanted to stop internet providers advertising broadband speeds which are far higher than the customer actually gets. Under the new rules providers will have to guarantee to provide a minimum of 80% of the speed they advertise. Up to now, providers advertise the highest possible speed, and that higher speed is only available to consumers living very close to a telephone exchange. Those customers further from the exchange, needing a longer cable, get a slower speed. Campaña Contra Incendios de Tenerife 2008 is to incorporate satellite use.